I have told you before about my love of Cauliflower Popcorn. Well this dish combines my love of the popcorn with my husband’s Homemade BBQ Sauce. These may be even more addicting! Who doesn’t like BBQ sauce, right? This is a great way to get your kids to eat their veggies. I’m not going to lie, the entire tray was gone in about 5 minutes! My 3 year old loved them! Plus, they are super easy to make. Cut the cauliflower into florets. I save the scraps in the freezer so I can make my Homemade Vegetable Stock . Place cauliflower onto a lined baking sheet. 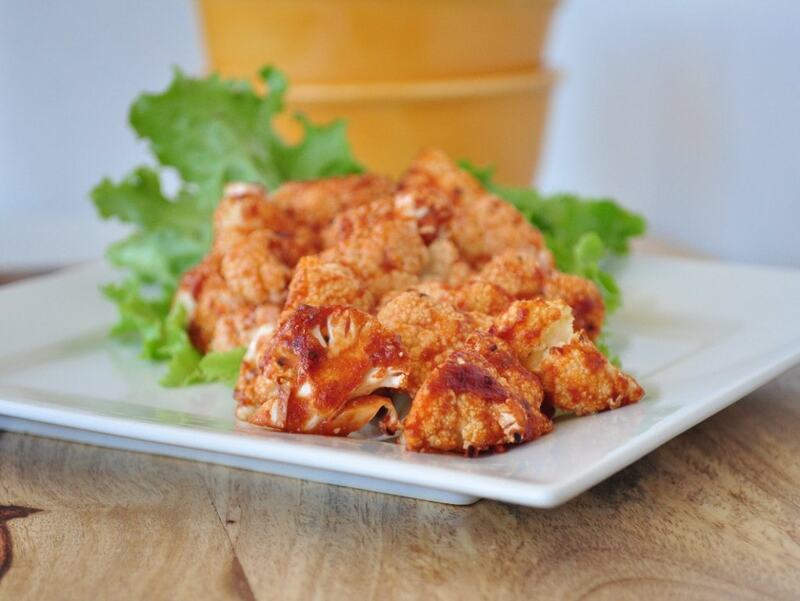 Brush on BBQ sauce until the cauliflower are all covered. Place in the oven a bake for about 45 minutes, checking every 5-10 minutes or so to shake in order to prevent burning. You may also want to brush more BBQ sauce on. That’s it. This didn’t last long in our house. My husband pretty much inhaled them! 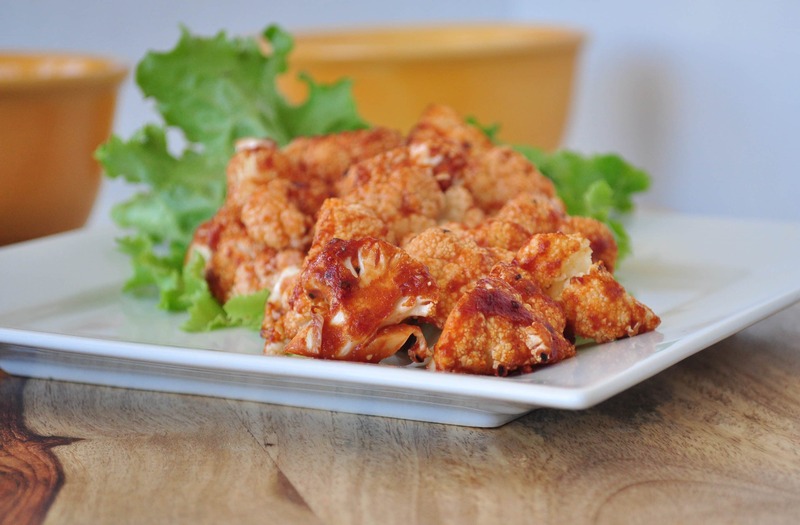 I'm not a fan of cauliflower but these are food :) especially love the BBQ sauce. How do you store left overs? We didn't have any leftovers! lol. I would store them in the fridge if I had some. Oh how I love this! I'm definitely going to try it out! Ohhhh my goodness!! I can't wait to make this! I'm picking up fresh cauliflower from our local farmer tomorrow. Can't wait to get it home & whip this up. Thanks for the delicious recipes!!!!!! You are so welcome Susanne! I hope you enjoy the recipe. Do you think this would work with buffalo hot sauce too? To be like a veggie buffalo wing? :) Or does it need the thicker sauce. The sauce may need to be a little thicker, but I think it could work. I keep telling my husband he needs to come up with a healthy buffalo sauce. I make Buffalo cauliflower all the time, you just roast them with salt pepper and olive oil before you coat them in the Buffalo sauce so they wont get dry. I'm going to try this on the BBQ!! Let me know how that works out! I would love to know. I've made cauliflower on the BBQ before dressed in olive oil and garlic. You have to watch very closely, it cooks fast. Do you think that if I cut the cauliflower into 'steaks' it would still work? I love BBQ sauce! Maybe? If you try that, let me know how it turns out. I tried this tonight!! My husband and I loved it. I did make it exactly how your recipe calls. However, right before I took it out I broiled it for a few minutes to get that extra char on it!! Very yummy....your recipes are awesome!! Thanks for the tip! I will try that next time! Yum! Satisfying and delicious. We roasted the cauli first in olive oil, salt and pepper. Also added some chickpeas, unpeeled garlic cloves, and cherry tomatoes. Added the BBQ sauce for the last 8 minutes of cooking. I love the addition of chickpeas. Yum! LIne baking sheet with foil?or parchment paper?